Practice-oriented, evidence-based guidance on assessment, management and treatment of suicidal behavior – one of the most devastating problems in modern society. Almost one million people die worldwide by suicide each year, making it one of the leading causes of death throughout the lifespan. Suicide attempts outnumber deaths by suicide by a ratio of at least 25:1, those who attempt suicide are at high risk of later death by suicide, and suicide risk is one of the most frequent reasons for admissions to inpatient psychiatric units. Treatment of those at risk for suicide is thus a pressing priority. Research over the past two decades has led to the development of excellent empirically supported treatment methods. This book aims to increase clinicians' access to empirically supported interventions for suicidal behavior, with the hope that these methods will become the standard in clinical practice. This book is both a compact "how-to" reference, for use by professional clinicians in their daily work, and an ideal educational resource for students and for practice-oriented continuing education. Structured similarly to others in the series, it is a "reader-friendly" guide covering aspects of the clinical assessment, management, and treatment of those at risk for suicide. It makes liberal use of tables, boxed clinical examples, and clinical vignettes, and other tools, for use in daily practice. The book, which also addresses common obstacles in treating individuals at risk for suicide represents an essential resource for anyone working with this high risk population. "[...] Each sentence [of this book] carefully crafted to contain meaningful content that will resonate with nearly every mental health clinician. This text is remarkably concise yet comprehensive, and the language is vivid. [...] [It] is replete with essential information that needs to be noted and digested [...]. For the seasoned clinician, the content will be validating. To further emphasize key points, useful schematics and tables are included as well as bold margin notes and clinical vignettes. All of these features enhance the use of the text as a reference." "This book achieves a fine balance between the historical / theoretical / empirical aspects and their clinical utilities. The author articulates with ease insightful information and reflections that join the many different up-to-date aspects of suicidology. [...] Experts engaged in training may find this guidebook useful for developing training manuals relevant to their own clinical settings. [...] This book speaks to mental health professionals in training as well as the experts. In well-presented style, the author takes you through the cornerstones of suicidology systematically." "As with any of the books in this series, a strong background, complete with terminology and definitions, is provided. What truly stands out is the discussion on risk assessment and the extremely useful take-away information in the many tables throughout the book. The discussion of treatment of suicidal patients has to be the most expansive and detailed on the subject, complete with differences between inpatient and outpatient services. Readers will also appreciate the case vignette and case example at the end of the book. The appendixes on suicide consultation and the decision tree for intervening with suicidal callers are definitely useful tools for practice. Quite simply, this is one of the most essential books you will read this year. Very rarely are books must read, but this is one." "Summarizing the clinical and scholarly literature on suicidal behavior in fewer than 100 pages is a daunting task. This challenging topic requires accurately portraying the dense web of issues that underlie suicidality. Richard McKeon's 'Suicidal Behavior' succeeds at what would seem to be an impossible task: making the complex clear, leaving nothing important out, and delivering a volume that is well written, thoughtfully organized, and enhanced by vignettes and clinical pearls… 'Suicidal Behavior' is divided into four sections. The first focuses on describing suicidal behavior and includes a discussion of definitional issues. A section on theories and models follows. Section 3 aptly combines risk assessment and treatment planning, eloquently illustrating the connection between the two. Finally, the largest section of the volume is devoted to treatment. In choosing to devote most of his text to treatment, McKeon avoids a common problem in past books on this topic, namely overemphasizing assessment and crisis management at the expense of treatment. He readily acknowledges a limitation of the literature on the psychotherapy of suicidal individuals: There are few clinical trials of interventions aimed at preventing suicides, and effectiveness studies are largely lacking… McKeon's style is refreshingly engaging. 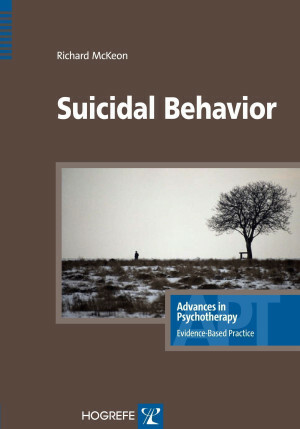 He uses brief clinical vignettes effectively to illustrate points, as well as clinical pearls that provide the reader with concrete examples of how to address specific challenges… Berman and his colleagues have convincingly argued that the competent practice of psychotherapy requires solid foundational training in the assessment and management of suicidal behavior, ongoing continuing education on suicidality, and supervision and consultation (Maris, Berman, Silverman, & Bongar, 2000). All clinical psychologists should read and master the contents of Suicidal Behavior. They will be richly rewarded, and lives may be saved."